Greek southern rockers Super Vintage, which features excellent guitarist Stavros Papadopoulos, also found in Freerock Saints, is back with a new dose of music. The previous albums have been high class releases both when it comes to music, production and performance. Opening track Southern Moon Rising is a cool bluesy rocker landing somewhere between Lynyrd Skynyrd and Bad Company in its vibe and feel. Delta Mud opens with some cool front porch acoustic guitar and slide, but soon moves into the electric southern rock living room. Classic southern rock, no more no less. Son Of Pain continues in the same vein, with some really nice dynamics and some killer soloing from Stavros. Let Me Be What I Want to Be kicks off with a nice busy riff and adds a bit of funky rhythms to the album. This is by no means any revolutionary album exploring new musical territories or extravagant new sounds. Super Vintage is like my Volvo. You get what you expect, what you're used to, it's trustworthy, works like a clock and you get that fine familiar feeling. 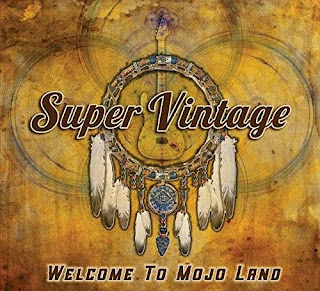 Super Vintage sound like they should, and it's good!